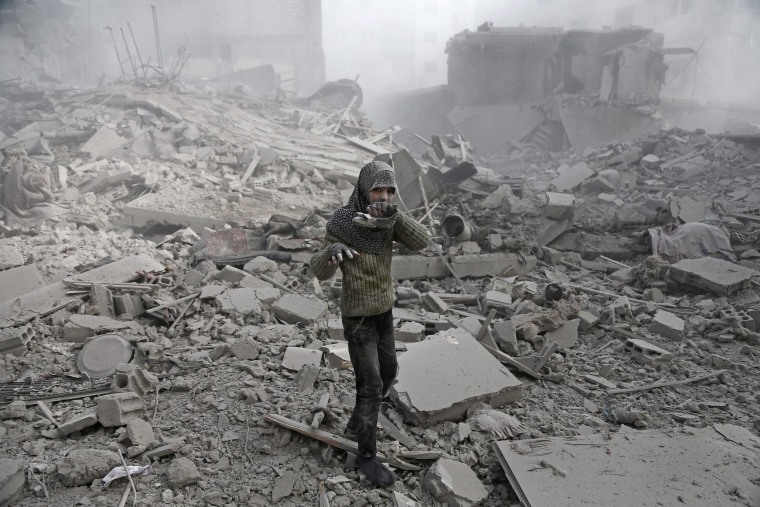 Eastern Ghouta is the last big stronghold of rebels fighting the Syrian government near Damascus and has been besieged for years. A Syrian girl holds her shoe as she emerges from rubble following an airstrike on Hamouriyeh, in the besieged Eastern Ghouta suburbs of Damascus, on Jan. 9, 2018. 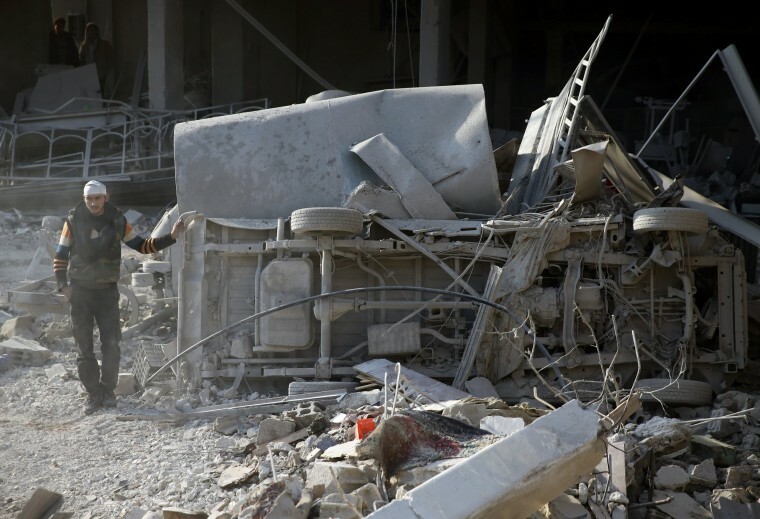 Government forces have escalated military operations against the suburb in recent months, seeking to tighten a siege that residents and aid workers say is a deliberate use of starvation as a weapon of war, a charge the government denies. 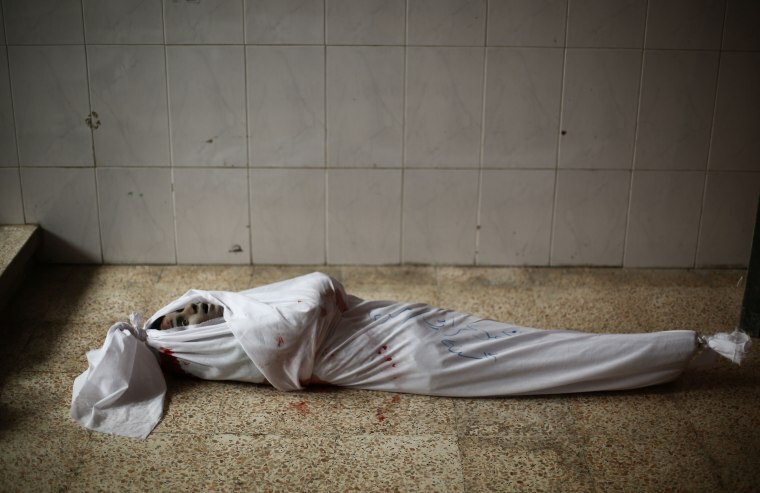 Warning: This gallery contains graphic images depicting death and injury. 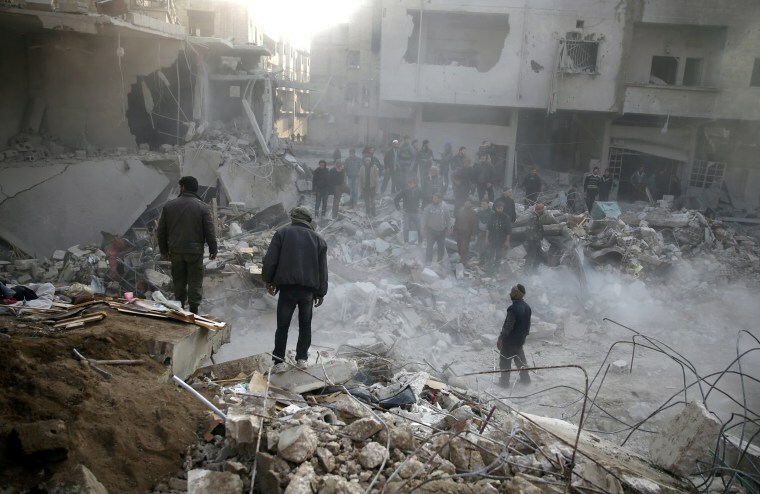 People stand on damaged buildings after the airstrike in Hamouriyeh on Jan. 9. 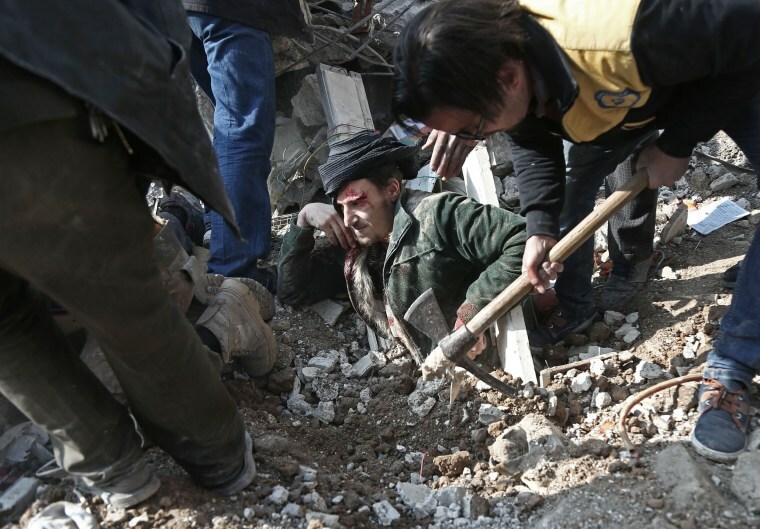 Members of the Syrian Civil Defense, also known as the White Helmets, dig a man out of the rubble in Saqba on Jan. 9. 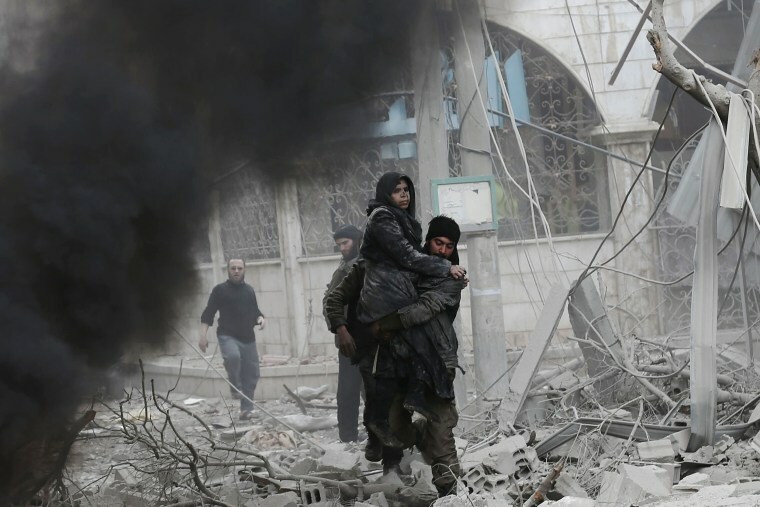 The United Nations estimates Eastern Ghouta is home to 400,000 civilians and says food and medical supplies have run low. A man stands beside an overturned vehicle in Hamouriyeh on Jan. 9. Volunteers dig a girl out of the rubble in Hamouriyeh on Jan. 9. 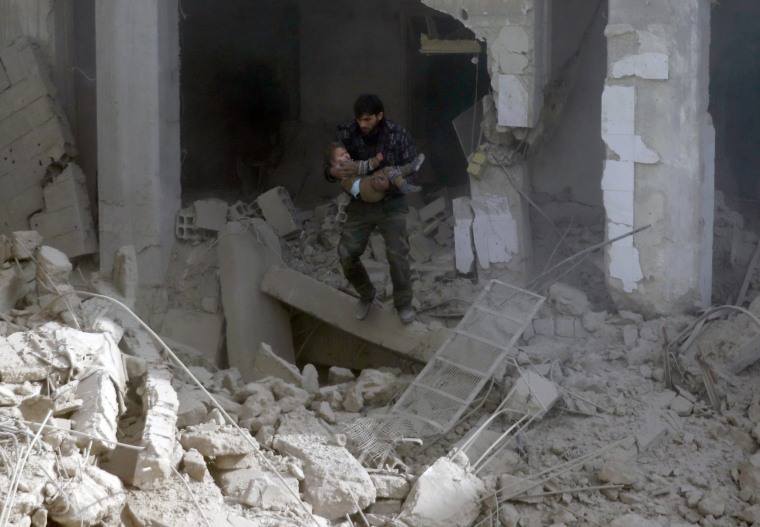 A man carries a wounded child as he walks through a destroyed building in Saqba on Jan. 9. 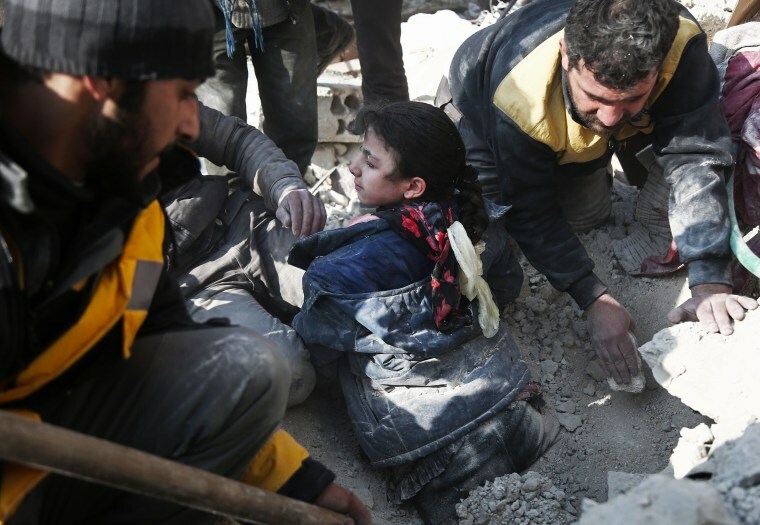 A member of the White Helmets carries a wounded girl after digging her out of the rubble in Hamouria on Jan. 9. 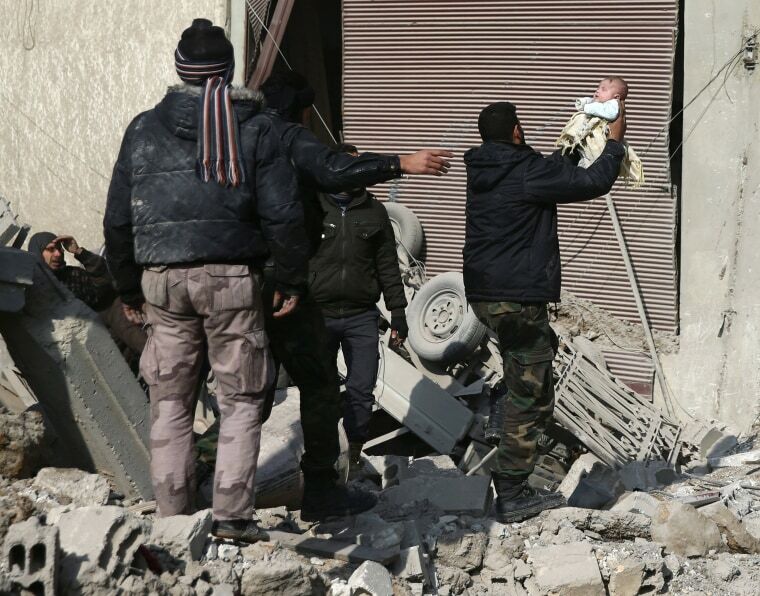 A man holds a wounded child in Saqba on Jan. 9. 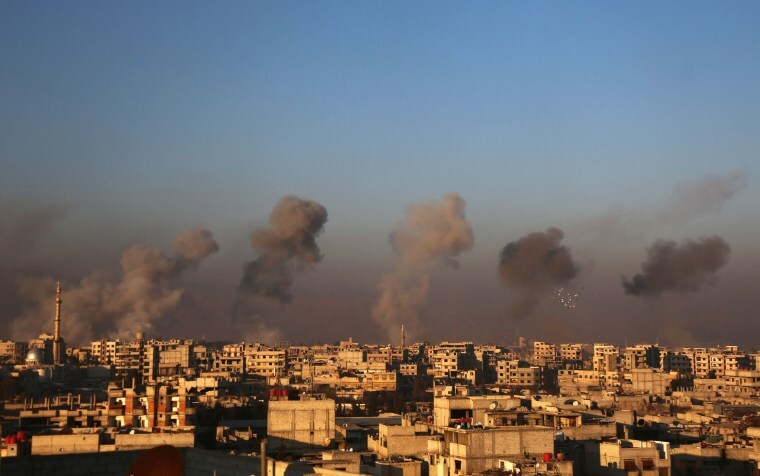 Smoke rises from buildings following airstrikes in Arbin, in Eastern Ghouta, on Jan. 8. 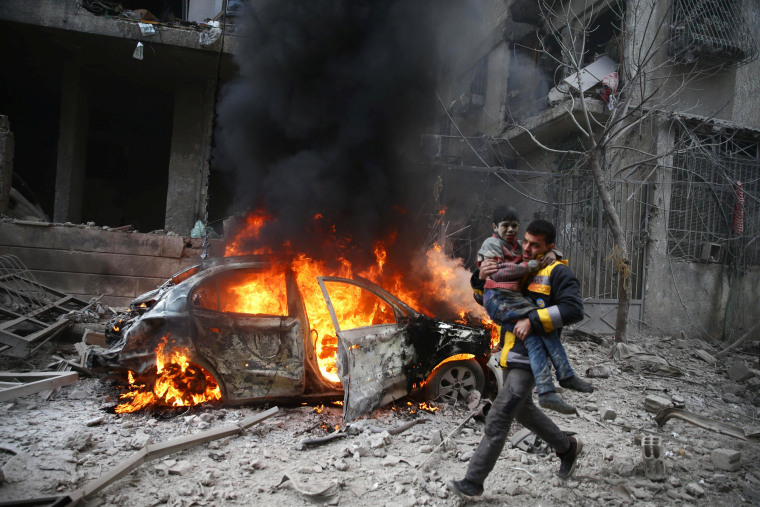 Members of the White Helmets evacuate wounded people in Douma, Eastern Ghouta, on Jan. 8. 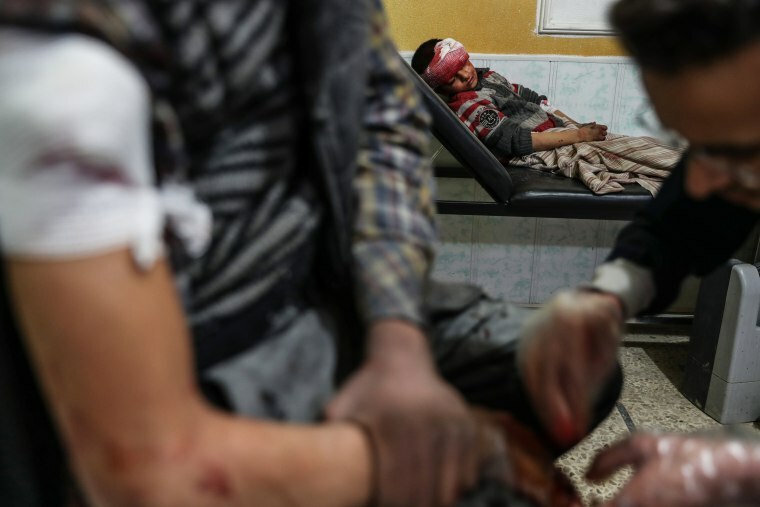 Medical staff treat the injured at a hospital in Douma on Jan. 8. 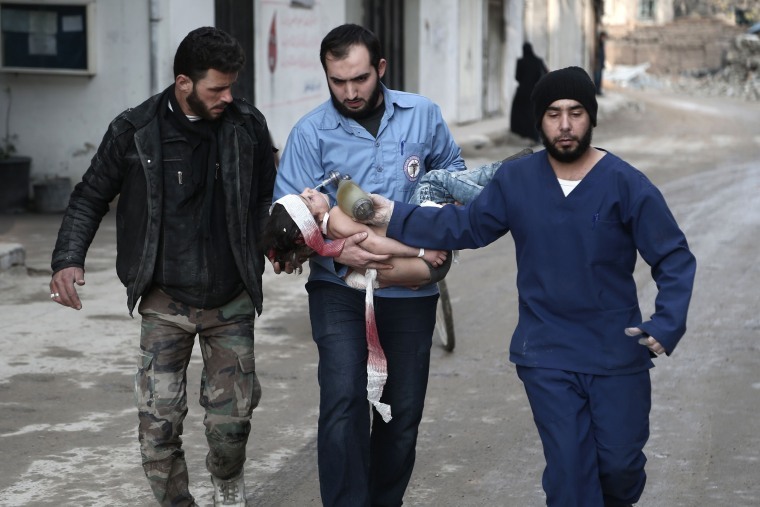 The body of a child lies on the floor of a makeshift hospital in Madera, Eastern Ghouta, on Jan. 8. 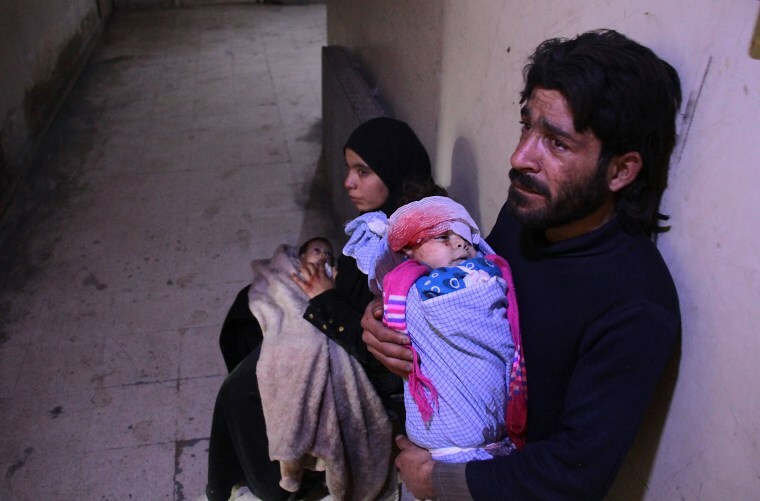 A father mourns over the body of their two-year-old son after he died from a shellblast in Douma on Jan. 8. The family had left their home in the village of Kafr Batna on Monday for a market in a nearby village, seeking food for their malnourished children, but a mortar shell landed close to them, instantly killing the boy. 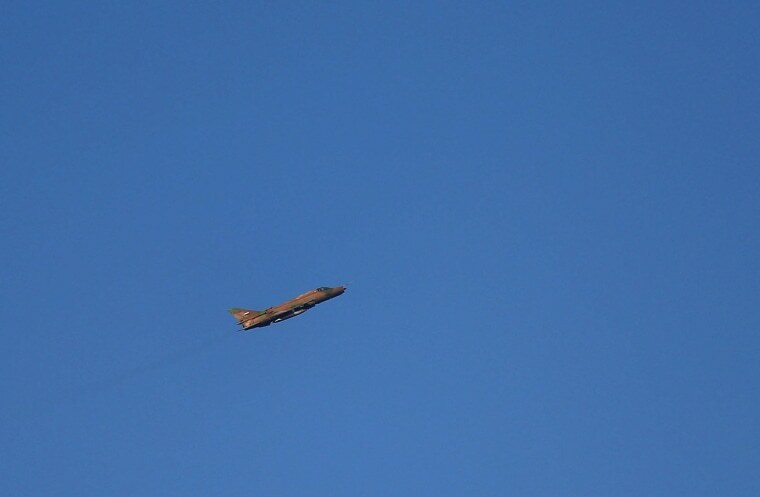 A Syrian government plane flies over Arbin on Jan. 8. 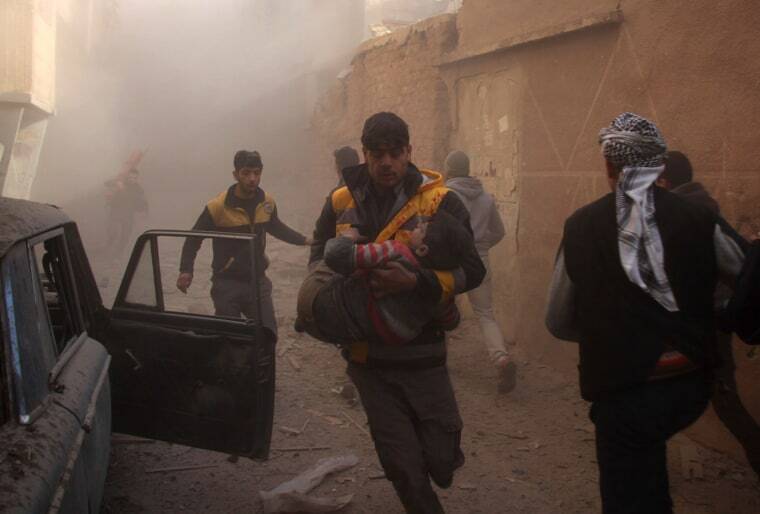 A member of the White Helmets carries a wounded child in Hamouriyeh on Jan. 6. 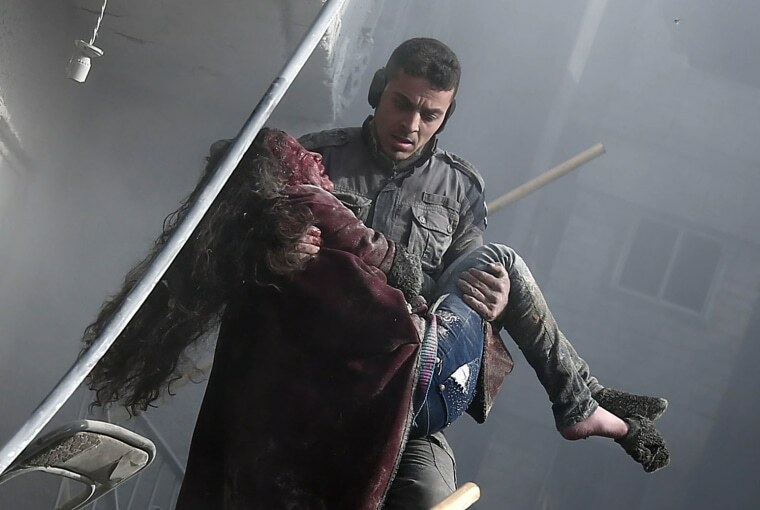 The volunteer first-responders Syrian Civil Defense reported 12 people killed in Hamouriyeh saying they included four children. They said five others were killed in other areas. 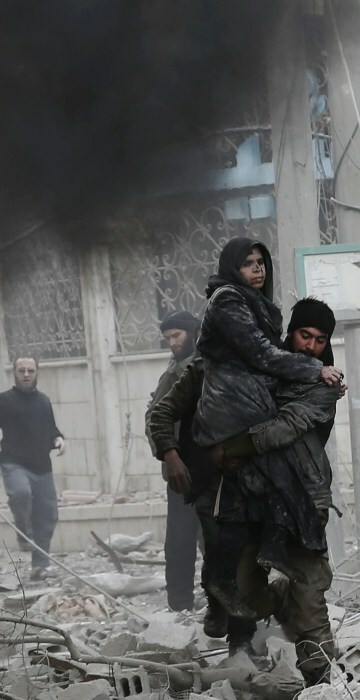 Syrian Civil Defense volunteers carry a girl rescued from rubble in Hamouriyeh on Jan. 6. 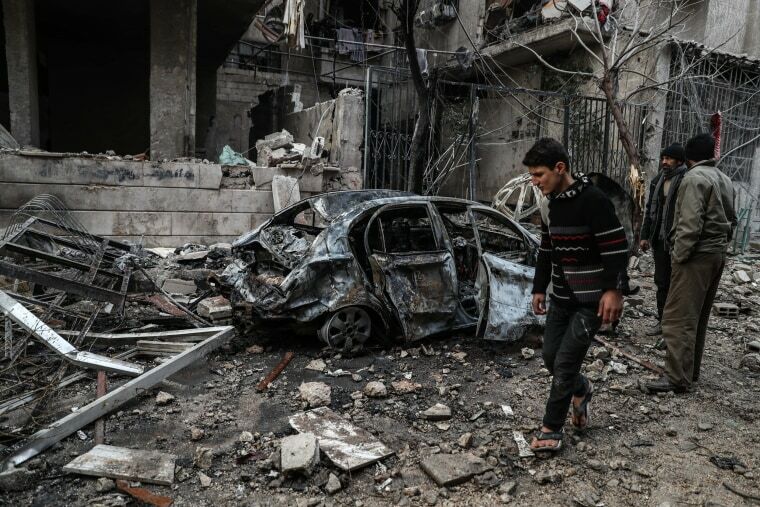 A boy walks past a destroyed car in Hamouriyeh on Jan. 6. A man carries an injured woman in Hamouriyeh on Jan. 6. 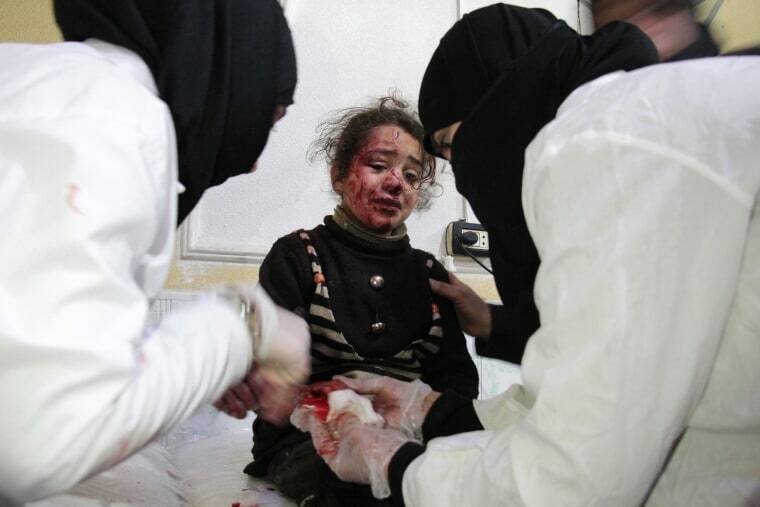 A Syrian girl cries as she receives treatment at a makeshift hospital in Douma on Jan. 6. 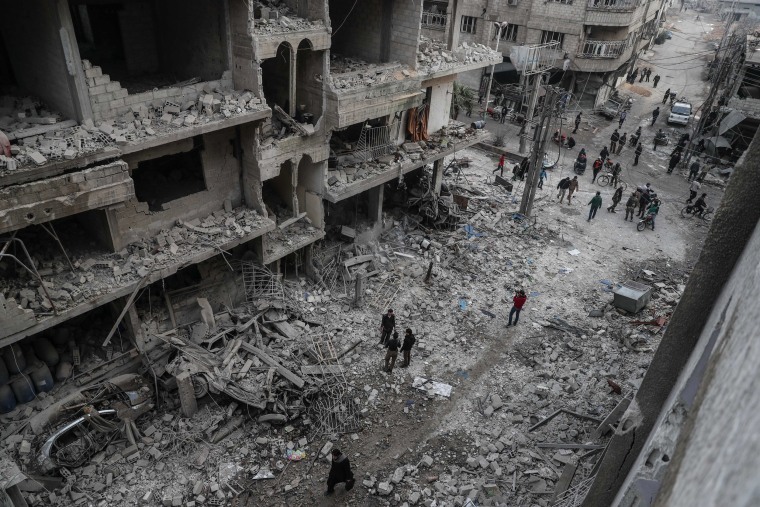 People walk through damage following airstrikes in Hamouriyeh on Jan. 6. 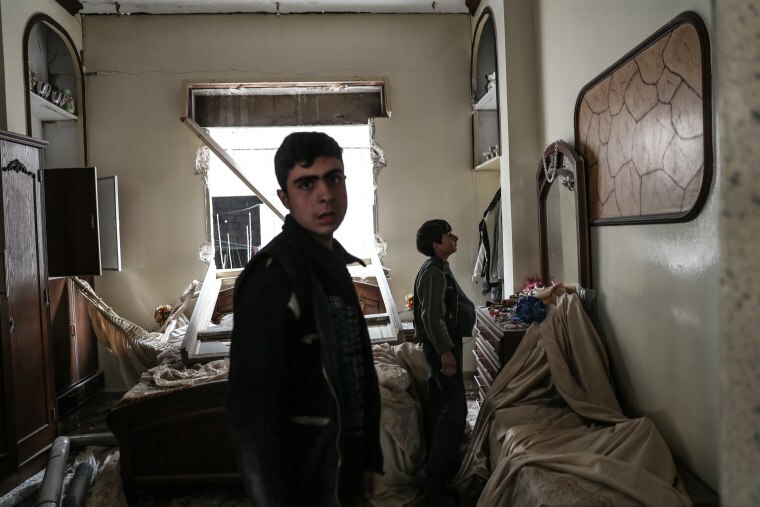 Young boys walk through a home destroyed by airstrikes in Mesraba on Jan. 6.